We spent 72 hours testing and researching 12 different styles and brands of shower tents and found that easy set-up, construction, size and features were the most common things that consumers focused on when shopping for a shower tent. 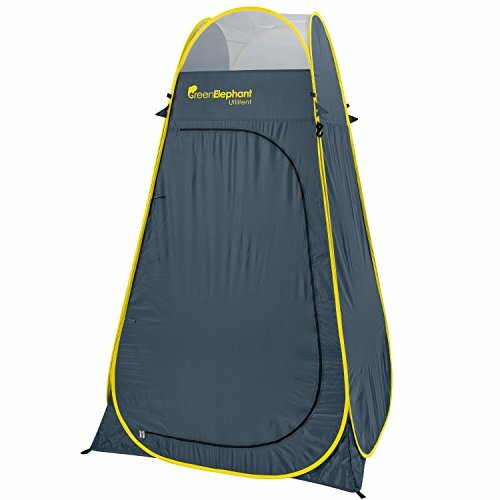 The Green Elephant Pop Up Shower Tent scored high above the rest of the competition in all categories that we compared and is over top overall pick. The Green Elephant Shower tent is easy to use and sets up in minutes. This shower tent features plenty of storage for all of your personal belongings, toiletries and clothes. It comes with a convenient carry bag that makes transport easy. The mosquito netting is a favorite feature too and keeps the insects out. Using public bathroom facilities can be really challenging for some people, which makes it very difficult when you are out in the wilderness camping or hiking. Many public bathrooms that are locate in campgrounds, the beach and parks can be really filthy places that you may want to avoid. Purchasing your own shower tent can prevent you from having to deal with public toilets and worrying that you are exposing yourself to numerous germs and bacteria. Shower tents are popular with those who enjoy camping, hiking, fishing, and hunting. They are available in many different sizes, styles, and quality levels and can make a big difference in how you feel about showering while on your excursions. Instead of having to worry about using public facilities which can be really dirty you can get a camping shower and one of these popular shower tents and shower privately right where you are camping. Choosing the best shower tent for your needs can be daunting if you are not sure what to look for or what to avoid. The reviews below of the three top rated shower tents and the buying guide below will help guide you on the path to choosing the perfect shower tent. You’ll have no worries with the Green Elephant shower tent. This easy to set up tent pops up in minutes and you won’t have to use the public shower facilities again. There are plenty of accessories that come with the Green Elephant including plenty of storage space, hangers for your flashlight and toilet paper if you want to use the shower tent as your privacy tent for your portable camping toilet as well. This shower tent is designed with no floor and keeps clean easily. The mosquito netting keeps the bugs down while you are showering yet still allows the cool air in. There is an additional rain cover that goes over the mosquito netting so your shower tent stays dry even during bad weather. This shower tent is compact, lightweight and comes with its own carrying case. The shower tent folds up as easily as you set it up so you won’t waste time fussing with it while others are relaxing and enjoying themselves. The material used to make this shower tent features zippers, high quality construction, and durable material that is water repellant. The stitching is strong too. There are tent pegs and guide lines with tensioners that have been included with this purchase that will keep your shower tent secure on windy days. If the ground is too rocky to use the tent pegs there are 4 sand bags and hooks that you can attach to hold the tent securely. This high quality product from Campla is made from long lasting steel and taffeta 191 Nylon polyester that is water repellant. It makes the perfect shower tent when the rain fly is removed and offers a private place to keep clean while out in the wilderness camping, hunting, or hiking. It is easy to set up and take down and folds up to fit into its own carry case so you can transport it anywhere. The sturdy steel frame ensures that it will stay upright even in higher winds. 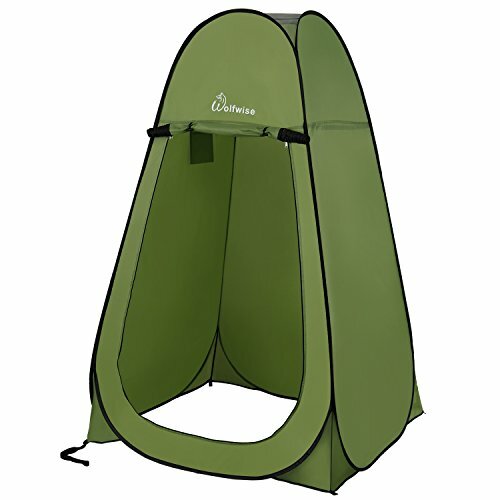 This shower tent from Campla provides all the privacy you need when showering and enables you to use your own facilities rather than worrying about using public showers which can be really dirty and crowded depending on where you are camping. The waterproof nature of the fabric prevents damage from occurring when showering and the ventilation windows allow for quick drying. This pop up shower tent by Wolfwise provides plenty of privacy right at your campsite for taking showers and has many features that make it one of the most popular shower tents on the market. The open bottom design will keep the bottom of the tent clean and the tote bag makes it super easy to transport wherever you go. The durable steel frame is very durable and long lasting and is perfect for all your outdoor shower needs. The premium taffeta nylon is strong and waterproof and can withstand the elements easily. Each shower tent from Wolfwise comes with 4 stakes to secure the shower tent to the ground so it doesn’t get blown or knocked over. Set up your shower tent in just seconds without having to worry about tent poles and don’t waste a minute of relaxation time. This easy to set up design makes it great for campsites with children and can double as a place for you to change clothes. Some people even use it as a toilet tent for privacy when using the bathroom in the wilderness. The seams have been thermos-sealed for maximum strength and you can’t see through it thanks to the cover unless bright sunlight is directly on it. Enlist the help of someone to test the shower tent in different places so you can find the safest and most private place for your shower tent. The three top rated shower tents featured above are all high quality products that offer all of the features you want in a shower tent including durability, easy set-up and take down, lightweight for travel yet able to handle windy days (with proper anchoring) and much more. If you spend a lot of time outdoors going on hiking excursions or camping trips you will love having your own shower tent where you can shower right at your campsite rather than having to gather all your stuff, traipse down to the public showers that may or may not be working properly, and having to walk back with dripping hair and carrying all your stuff. Shower tents will do away with all of that hassle! Once you are ready to purchase a shower tent, choosing one of the three top rated choices above will get you a great, high quality shower tent that you can use on all your outdoor overnight adventures. If none of these three selections interest you there are 7 more listed below that you can consider. The reviews that we have provided above should help you by giving you more of an understanding of what makes a great shower tent. All three of these featured selections topped the charts in all of the categories we compared them in against other brands and styles. We’ve listed others that you may want to look at as well. If you want to know more about how to choose the right shower tent for your needs, read the buying guide below. We have put together a lot of information on what to look for, features of different shower tents, and how to determine your needs. This information will help you sort through the many different choices and decide on one that will be just right for your outdoor adventures. Let’s get started. The benefits of a shower tent are pretty simple and straightforward. They offer you the ability to have privacy in your own campsite to take showers, change clothing, and wash up without having to worry about passersby seeing you. Some people use shower tents to surround their camping toilets so you have a little “bathroom”. The main benefit will be privacy which is something you may not have a lot of if you are staying in a busy campground. Another benefit to a shower tent is that you will be able to stay clean even when camping for longer periods of time. 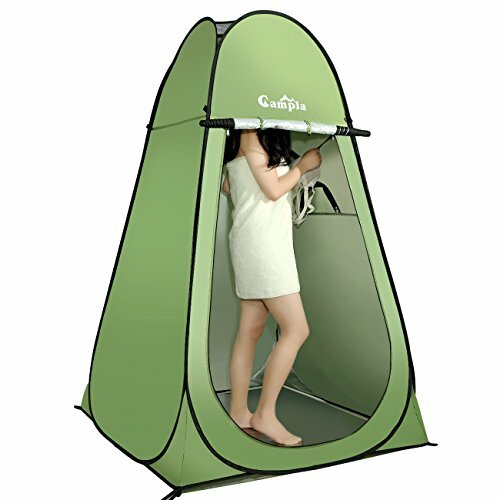 If you have invested in a camping shower (another great product) having a shower tent to complement that will be something you will really enjoy when you have gotten muddy, dirty, or just sweaty from hiking. Having and using a shower tent to clean up will also keep your sleeping bag or sleeping items clean longer. Getting into a sleeping bag night after night when your body isn’t clean is not a good idea nor is it very comfortable. After a while your sleeping bag will start to have a bad odor and be very uncomfortable; being able to shower each night before going to sleep will keep your sleeping bag in much better shape. If you have children you will really appreciate being able to clean them up before they crawl into their sleeping bags at night and they will sleep much better clean as well. Another very popular aspect of shower tents is that you are not limited to places that have shower facilities anymore. If you like more remote camping but usually avoid these places due to not having facilities, a shower tent is going to open a whole other world for you. Keep in mind you will need a camping shower and water supply whether from bottled water or a nearby river or lake, but that is it. You don’t have to be restricted to public campgrounds that have showers anymore. There are mainly two different styles of shower tents on the market. Single space pop ups – Single space shower tents have room for one person to change clothes, shower, and otherwise get cleaned up. The pop up varieties make set up super simple and can be accomplished in seconds. Double space – double shower tents are almost more of an ensuite style and have room to shower on one side and get dressed on the other. This is a great choice for families with kids since there is room for the parent to help the child wash and get them redressed if they are a lot younger. Along with the intended use as a way to have privacy when showering outdoors, there are many other things that people can use their shower tents for. If you know ahead of time what you will be using the shower tent for it will help you choose the one that best suits your specific needs. Sometime they can be used as dressing rooms for photo shoots or for trying on clothes at outdoor craft shows or flea markets. Some people use them as privacy tents for camping toilets or for just a place to have some privacy away from prying eyes. The choices of what to use it for are up to you. Outdoor camping can be a ton of fun for adults and kids. A shower tent will make that experience ever more fun and a lot cleaner too. Below are some things you want to look at when comparing different shower tents. Size – Be aware of the dimensions of the shower tents you are considering. You will need to choose according to the body size of the biggest person that will be using the shower tent because everyone else using it will be smaller so they will fit. A larger-sized shower tent will be much more comfortable for everyone to use. Construction – Be sure to check out the construction of the shower tent. Look for models that have a steel frame with a quality cover like polyester nylon. Make sure that the material used for covering the frame is waterproof so there is less heat conductivity. Weight – A heavier framed shower tent is going to be a lot sturdier when set up but keep in mind that if you are hiking it will be a lot heavier to carry as well. Lightweight frames are great for hikers and campers that walk to their campsites. If you are car camping then weight won’t be as much of an issue. Design – The design of a shower tent is also important. Choose one that has a large doorway and plenty of pockets for toiletries and extra clothing. An Ergonomic design is very pleasing to look at as well as being easy to use. Ventilation – Proper ventilation provides airflow through the tent which keeps it fresh and clean inside. Side windows and top vents of mesh are the best ventilators that keep air moving through the tent and keeps it feeling comfortable and not stuffy or too hot. Foldability – If you have ever had a shower tent in the past you know that they can be very difficult to fold back up when it is time to go home. Newer models are being designed with ease of set up and take down in mind. Look for shower tents that state they are easy to fold up when not in use so you don’t have to struggle with it each time. When you start looking at specific shower tents on the market there are some features that you will want to look for that make the shower tent even more enjoyable and beneficial to have. Not all shower tents have the same features so pay attention to the descriptions as you are shopping around. We have listed these common features below. Pop up style – Pop-up shower tents are very easy to set up and make quick work of getting things ready at your campsite. The tent opens in seconds and as it unfolds it automatically set itself up. All you will need to do once it is set up is stake it to the ground so it is sturdy and will not blow over if it is windy. Packing up a pop-up tent is just as easy. It will collapse into a flat circle shape and be very easy to store or pack away. Pole Assembly – The rigid pole assembly could take a little bit longer to install but it is well worth it especially if you are camping in bad or windy weather. They are much sturdier and more durable when faced with inclement weather and the rigid poles are better suited to hold the shower bag more easily. Mesh Storage Bags – These useful mesh storage bags are great places to put your soap, shampoos, and other toiletries so they are not on the ground. They keep everything within reach and allow the water to drip off. Hooks and Shelves – Look for shower tents that have built-in hooks that are strong enough to handle your camping shower. Some have pockets or even shelves for clothing or toiletries. The more hooks and pockets it has the more convenient it can be for you since it can store the belongings of many campers. Towel Hangers – Another great feature that shower tents can have are towel hangers. These hanging rails are accessible through zippered openings. These hanging rails are very convenient for hanging your towels so you can easily reach them without the towels getting wet. Mesh or Open Bottom – Some shower tents are designed with open bottoms so the water can get out easily and not pool in the bottom of the tent. If you choose an open floor design you may want to get a rubber mat for the bottom of the shower tent so you are not standing on mud. The mat will be easy to rinse off. Some have a built-in tarp with mesh sides that users can stand on that will allow the water to drain off. This is a very beneficial feature to have in a shower tent. Water Capture Tray – There are some campgrounds that don’t allow shower run off. To avoid this from becoming an issue, look into getting a water capture tray for the shower tent floor. This tray will catch the run off from showers that are taken. Once the shower is over you can dispose of the water properly according to the campground rules. Not all shower tents have this feature so make sure you check the description to see if the shower tents you are considering offer this option. Ventilation – If your shower tent does not have proper ventilation, showering, changing clothes, or using the camping toilet if you are using it for that purpose can be stuffy, uncomfortable and pretty miserable. Look for a shower tent that has at least one window covered in mesh as well as a mesh top. Cheap shower tents usually don’t have any ventilation so it is well worth the extra money spent to ensure this ventilation is present. Proper ventilation will keep the shower tent comfortable and easy to use. Interior Amenities – We mentioned mesh bags and hooks above but there are some other amenities that a shower tent can have especially if it is a two room shower tent. If you are going to buy a solar powered camping shower you want to make sure that the shower tent has a shelf or rigid rod that will hold it. 5 gallons is not a lot of water but it can be too heavy and clunky to deal with if there is nothing to hang it to. The double sided shower tent will have ample room on one side to undress and then step into the shower side then step back out, dry off and get dressed again, all without having to struggle for room or risk getting your clothing wet. 1. Zipper quality – Look for zippers that have double-sided pulls and are easy to close and open. Strong zippers are important because no one likes to mess with a lightweight, flimsy zipper that breaks or jams easily. 2. Stability – Most shower tents offer tent stakes or sand bags for stability. Some shower tent models offer both, the tent stakes and then the sand bags for extra stability or for areas where tent stakes can’t be used. The stabilizers will help keep the shower tent securely against the ground which is very important, especially when the weather is windy. The last thing anyone wants is for the shower tent to blow over while it is being used. 3. Price – Shower tents have many different price points so it is fairly easy to find one that will fit into the price you want to pay. Setting a budget before you start shopping is a very good idea so you don’t overspend once you start looking for your shower tent. You don’t want to look for the cheapest shower tent you can find because it will perform like a cheap shower tent and chances are you will be very disappointed with the results and outcome. Find the best shower tent you can for the money you can afford. Higher quality shower tents and double room shower tents will cost more than single space models but they are well worth the extra money because they will usually last a long time as well. 4. Warranty – Look for shower tents that come with a warranty of some kind that will protect you in the event of problems with the tent from the beginning or if the shower tent seams or zippers fail early on when you first get it. Most shower tent warranties will be one to two years long and can provide reassurance that the company stands behind its product. 5. Style – There are many different colors and styles of shower tents available. Most come in bright colors like blue and green but there are natural colored ones as well. Keep in mind that a neutral color is less likely to be noticed so you won’t draw attention to yourself while you are showering. 6. Brand Name – Just like with any other product, the brand name of the shower tent is important. Some companies are known for quality products so you can be confident when looking at that brand’s products that you are going to get a shower tent that is made well, has lots of features, and is covered under a warranty of some kind. If you have a favorite brand that you usually purchase your camping equipment from you can start with them to see if they carry a shower tent with the features and design you like. As long as you stay with known brand names you will have a good variety of quality shower tents to choose from. 7. Carrying Case – Most shower tents will come with a carrying bag of some kind to make it much more convenient to carry while hiking or when you are unloading the vehicle at the campsite. These bags are typically very simple and have a strap. It is not recommended to put the shower tent away wet, so if possible give it a chance to air dry before putting it back into the bag. If you are not able to wait until it is dry, remove it from the bag as soon as you get home so mildew and mold don’t set in. Shower tents are a great way to stay clean and comfortable while on hiking, fishing, hunting and camping trips. You won’t have to worry about how you will take a shower anymore nor will you be restricted to places that have public facilities. Some campgrounds have nice public shower facilities but there are some that are downright scary and campers would rather avoid them. There is also no privacy when using a public campground shower. A shower tent is a very simple item that provides tons of convenience and privacy for the campers. Many people purchase them for privacy when showering or using the camping toilet. (The toilet and shower are not in the same one) Many people use them for dressing rooms at flea markets and other great uses where some privacy is needed. The first step in choosing the perfect shower tent for your needs is to determine what your specific needs and preferences are. Keep the size of the campers in mind as well so you choose a shower tent that has plenty of room for all of the campers to fit comfortably when it is their turn to shower. A shower tent is a very versatile item and can be used for a number of things, not just camping showers. There are many different models and brands on the market to choose from but with the right information on hand you will not have to become overwhelmed or confused about how to look for the right one. The three top rated shower tents we have featured here are all high quality tents that have plenty of features and durability to take care of a multitude of needs. If you do not like any of the three top rated shower tents, you will be able to use the information we have provided here in this guide to determine what you are looking for, sort through all of the different options and choices, and make a confident decision on the right shower tent for your needs.